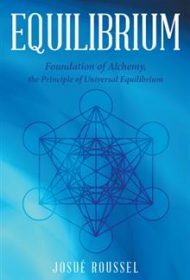 Equilibrium, by Josué Roussel, is a metaphysical manifesto, in which Roussel attempts to identify the true nature of the universe and the origin of good and evil by applying the ancient science of alchemy. Alchemy, in its original sense, is a method of physical and spiritual transformation, which influenced Kabbalah and the hermetic occultist movements of the 19th century (influences that are also present in Equilibrium). Roussel asserts that all reality, in this world and beyond, can be understood through the proper interpretation of two sacred symbols: the Star of David (which symbolizes, in part, complementary opposites similar to the Taoist idea) and the Metatron’s Cube, named for an archangel of Judaic origin. The author spends the majority of the text trying (with convoluted sentences, non-sequiturs, and arcane diagrams) to explain the significance and intricacies of these signs, and the alleged secrets they reveal about existence. But his argument lacks the necessary elements to be persuasive. Roussel insists that he is offering objective, scientific insights but supplies no empirical evidence, and actively disdains the scientific method. Neither does he claim to have had a spiritual revelation, although his writing has the zealous certainty of prophecy. Passages are repetitive, cryptic, ungrammatical, often puzzling, and tend toward ranting, with block paragraphs lasting several pages. Sometimes it’s difficult to say whether Roussel is speaking metaphorically or not. For example, he uses death imagery (the most common nouns are “corpse” and “carcass”) to poetically describe morally corrupt individuals, but also seems to imply that such individuals are somehow literally dead. In the last pages, Roussel describes what realizing his notion of equilibrium would look like, while offering no real prescriptions for achieving it. Ultimately, his project fails by the most relevant measures: It lacks the logic of philosophy, the credibility of science, the authority of religion, and the inspiration of spirituality. It presents an extremely challenging read; most will find it hard to persevere to the end.